Even though most of us have gotten comfortable handing our credit card numbers online for hotels and airfares, even the biggest online spenders get a little uncomfortable when it comes time to buy that desert tour or atv ride over the internet. We have all heard stories of scams that have made us skeptical about the 1998 looking website selling Cabo tours. You ask yourself – Will they take my money and run? So how do you tell if the website is legit? I’ve complied a few ways to check the authenticity of the websites. Most websites that get caught doing bad things are shut down pretty quickly. Online scams don’t stick around for a long time. If it just popped up, you have reason to suspect. Check out archive.org to see some of the tour website’s history. The website could possibly just be a new tour company, but if it’s new you should do just a little more digging. Snoop around sites like Tripadvisor or Yahoo! Answers to see if anyone has any reviews of that company. Even if the company is legitimate – it helps to know what you are getting into (bad service or just helpful hints). Type in the tour company’s name in your search engine with terms like “rip off” or “scam” following it. If anything comes up, you know you are probably dealing with a scam. Ok, I know this is a nerdy way to look at it, but it’s worth a mention. 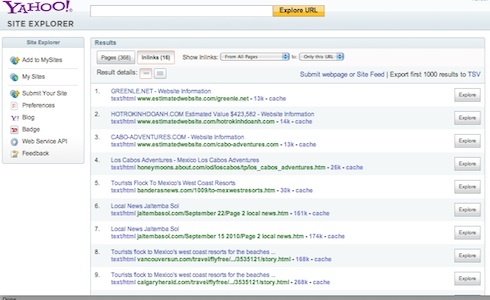 Yahoo Site Explorer will show you what other pages are linking to that website. Try the site with the www and without. If you see big players (International newspapers, tourism boards, etc) you recognize on the list – chances are the company is legitimate. No in links? Be scared. Make sure that the checkout page is secure. If the URL changes from starting with http:// to starting with https:// the website is secure. That little ‘s’ in https:// is saying to you “this is a secure page.” Another thing to look for is secure brands like Verisign or the BBB. Even if you do see the logo, click it and make sure it’s legit. These are just a few guide to check to make sure that those Cabo tour websites are legit. However, the most important thing to do is to trust your instincts. If the webpage looks sketchy and no one else seems to be talking about it even though it has a great price, I would be pretty weary of handing them my credit card’s digits. 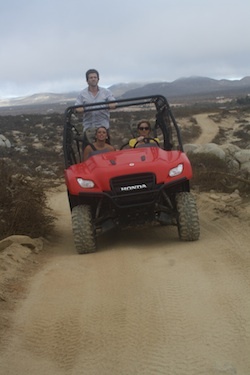 Has anyone been ripped off by an online tour company in Cabo? Has anyone had a great experience booking a tour online? Share with us! Cara Gourley is the Director of Web Strategy for All About Mexico as well as an All About Girl. She’s a certified Los Cabos Expert and has been to Cabo many times. If you have any questions on restaurants, hotels or activities, Cara would love to help you! You can head to the forum to ask a question or you can email her directly.